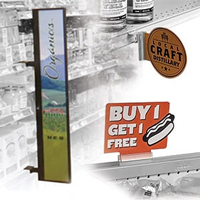 Increase incremental sales and impulse buys with these attractive and effective retail aisle violator sign holders. Aisle violators, or aisle violator sign clips, are named because of the way that they protrude from gondola shelf edges or retail end cap displays of store aisles. 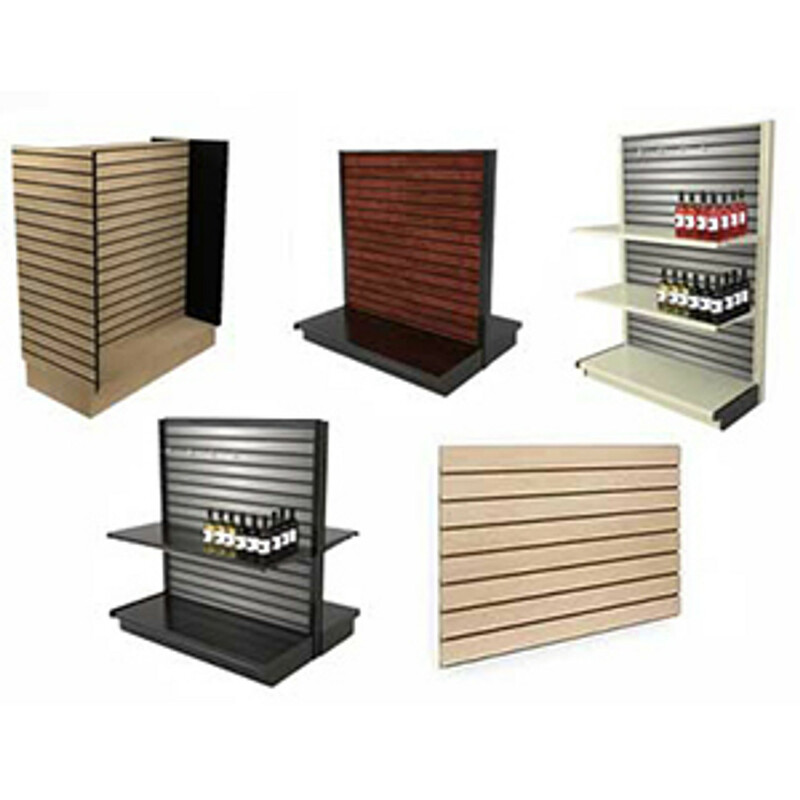 They grab your customer's attention and direct it to the items featured on the retail shelving systems. 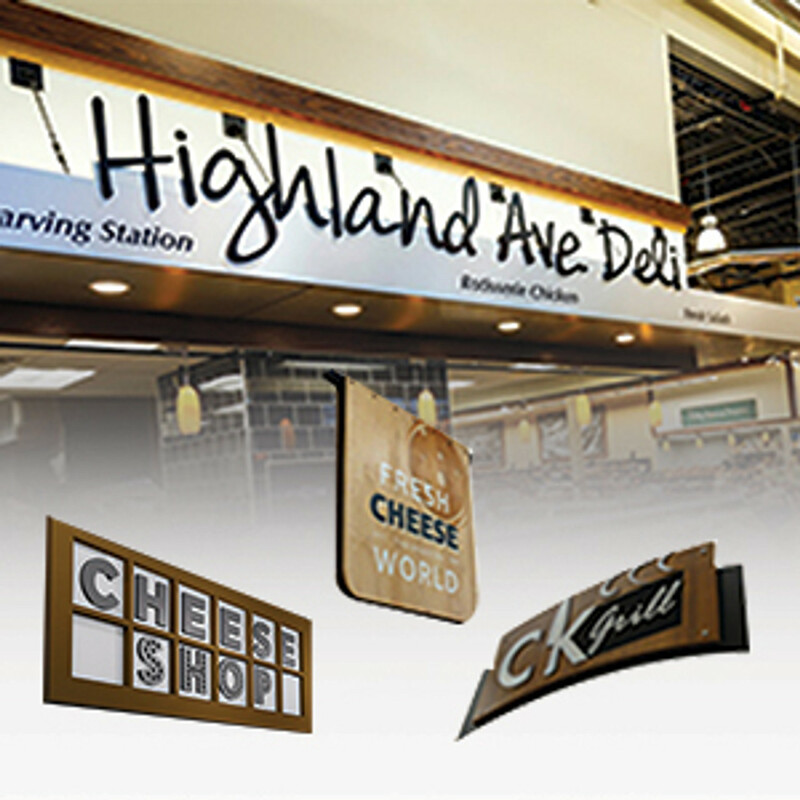 Aisle violator signage is used in many locations - grocery stores, supermarkets, pharmacies, liquor stores, and convenience stores all use a style of aisle violator signs. 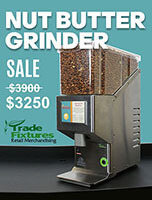 They bring attention to special products and and advertise promotions that store managers want to sell. The edges of retail shelving and promotional end caps are the first things that a customer sees when walking through your store. Many savvy store operators understand this, and so place sale items or items that they need to move quickly, on the end caps or on gondola shelving, making them more visible to passing shoppers. Strategically placed aisle violators will capture the passing shopper's eyes. Aisle violators have been shown to increase impulse buys of the items referenced in the in-store signage. Many times, people in a hurry will grab whichever product is advertised on the aisle violator sign, and not even turn down that aisle. 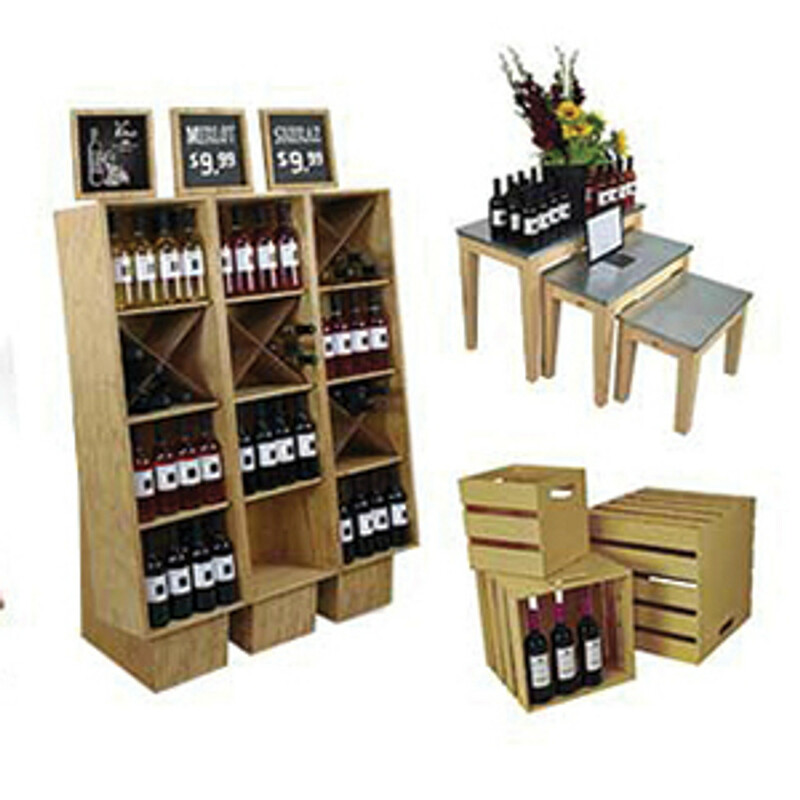 Savvy merchandisers may choose to put very profitable items in the end cap section, to entice these hurried shoppers. Aisle violator signage is called many things. 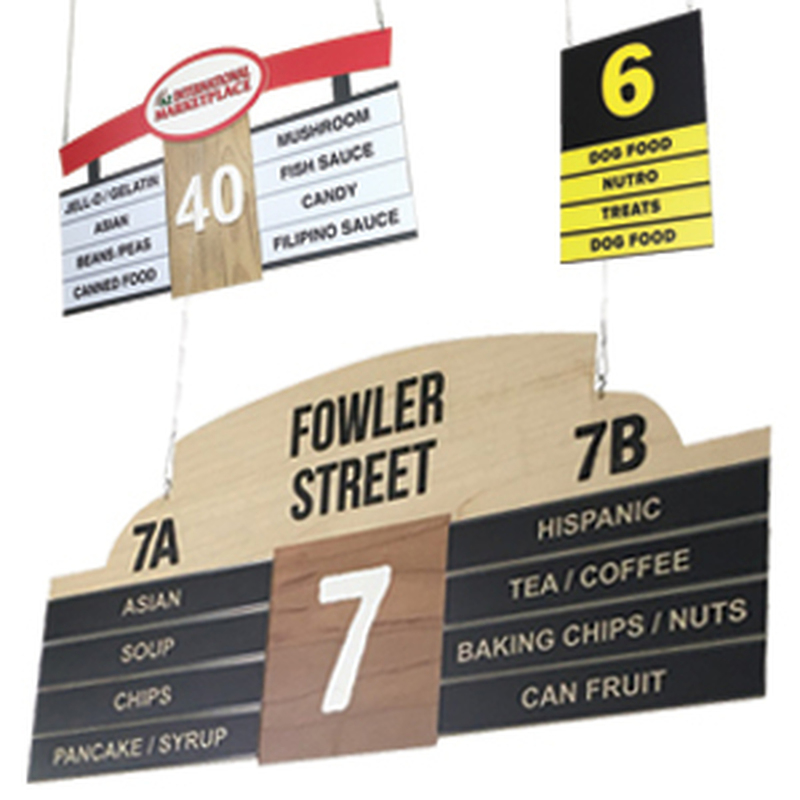 These include aisle blade signs and aisle invaders or interrupters. They are generally all the same type of sign although blade signs tend to be long vertical signs that are shaped like a knife blade. 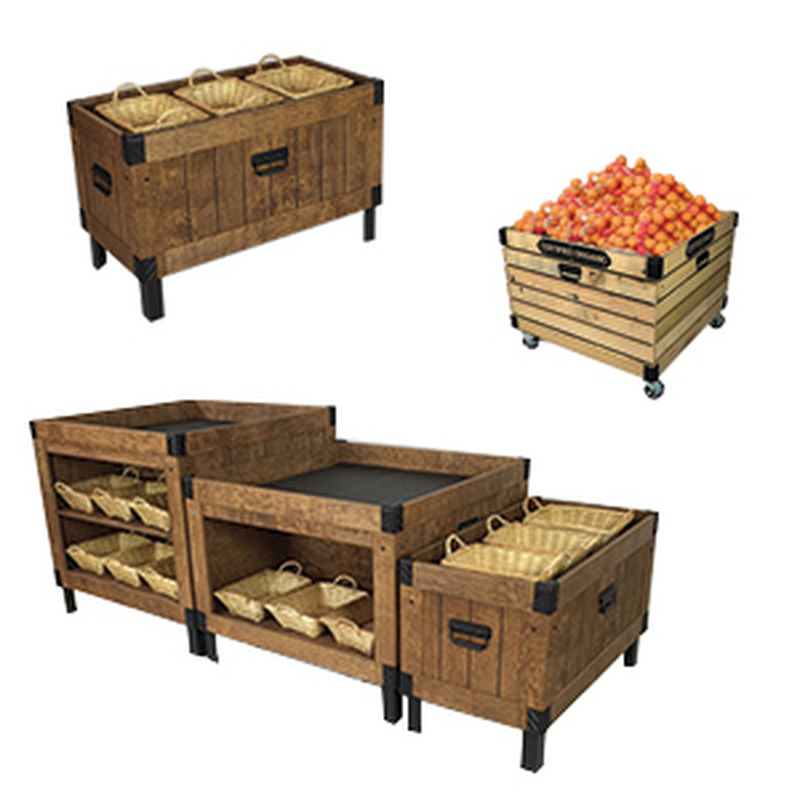 These work well for delineating a section of gondola shelving for brand blocking or for type of products being merchandised. In hardware stores, as an example, blade signs might be used to section off different types of fasteners or light bulbs down a store aisle. Typically, big box home improvement stores carry seasonal merchandise, and need to move many specialty items in a short period of time. In this case, aisle violators inform customers of items that aren't typically for sale in these stores, and cause them to stop and consider as they shop for other home items. When large warehouse-style home improvement stores need to move little items quickly, they choose aisle violators and blade signs. DGS Retail sells many types of aisle violator hardware. 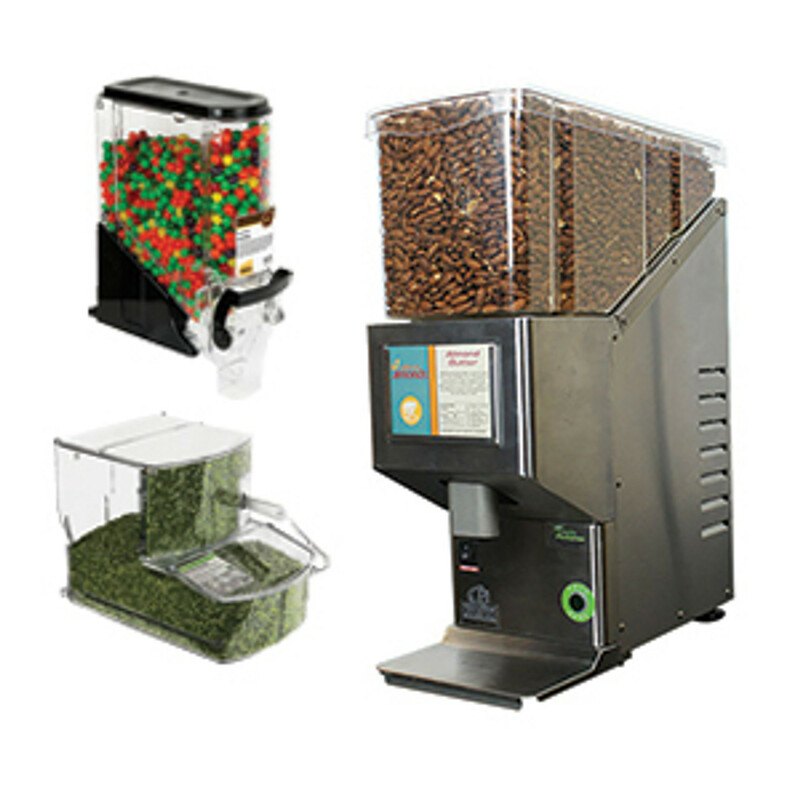 These include aisle violator clips and retail shelf sign holders. They are generally plastic construction. These retail sign holders are very impact resistant, long lasting and waterproof. This makes them spill-resistant as well, so even if they are placed on a display with spill-able goods, the aisle violator clips themselves will not be damaged. 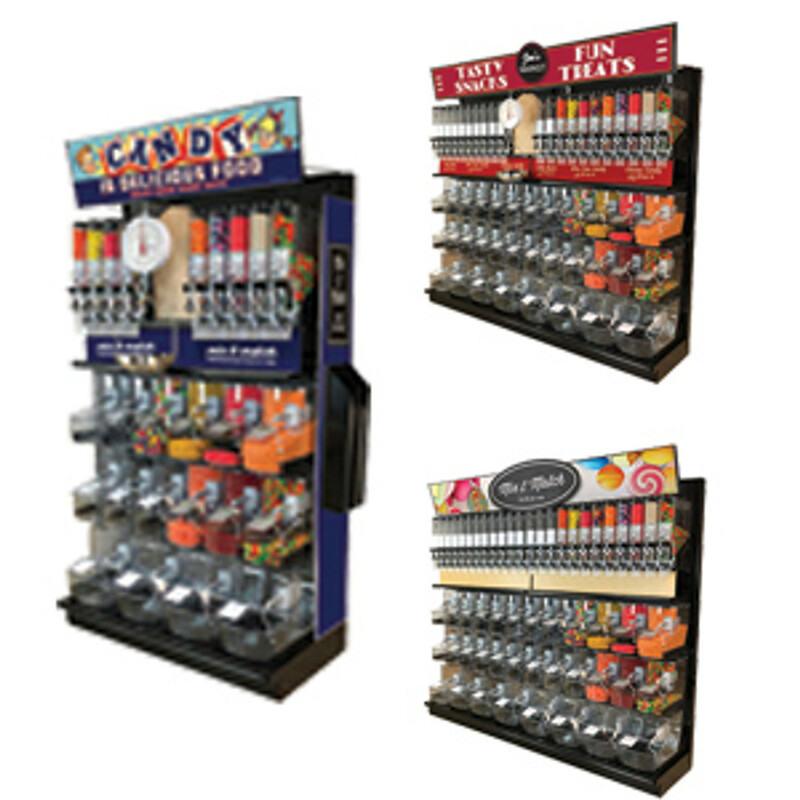 The clips are durable, as well, and the ones that are designed to be removed - the magnetic ones, the suction cup ones, and the ones that clip on existing gondola shelf edges - stand up to multiple repositioning throughout the selling floor of your store. Aisle violator hardware comes in a variety of types, adhesion specifications, and sizes to fit any type of aisle invader signage display. The clip-on aisle violator sign holder will easily attach directly into the existing gondola shelf channel. 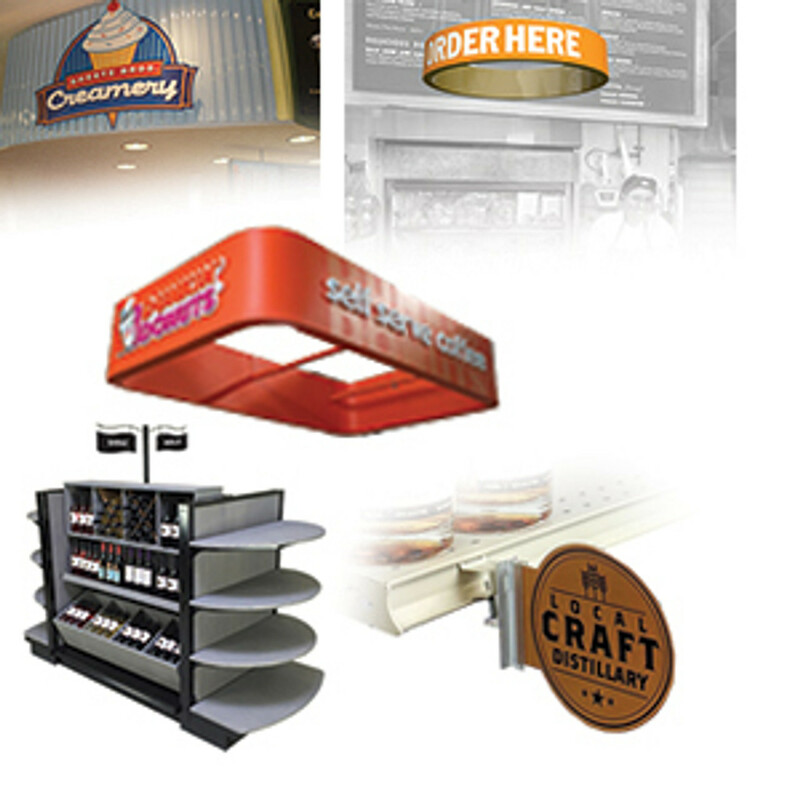 They are designed strong to hold aisle violator printing signage. Many of these clips feature plastic gripper sign holders. These are used to securely hold the printed aisle violator signs in place on the shelf edge or store fixture. The smooth edges of the sign holding clips allow store managers to change out the signage on a weekly, or as-needed basis, without damaging the custom aisle violator signs themselves. For metal shelving, choose aisle violator sign hardware options with magnetic adhesion. 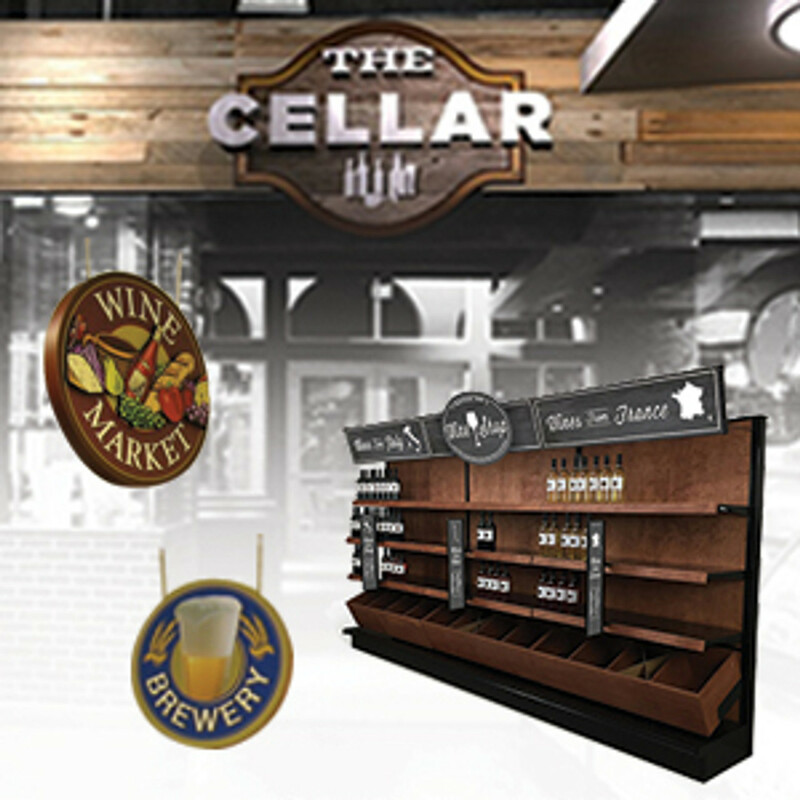 The slender magnets are deceptively strong and will hold display retail signage securely in place. 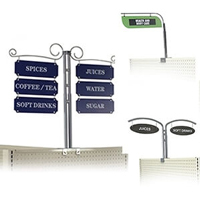 These types of magnetic aisle violator sign clips use ceramic neodymium super-strong magnets and will adhere to all steel surfaces in your store. One of the main complaints about inferior sign holders is the lack of stability of the signs in place. It is difficult to display information about the merchandise display if the signs have become dislodged from their intended position. The magnets are completely reusable and sturdy. Some aisle invaders are adhesive backed, using industrial strength adhesion. This type of sign clip works best for a fixed display, where the product is rotated in and out, and the signage itself changed to inform about the new product or special. The display unit itself remains in place, as does the adhered aisle violator clip. The smooth grips in the sign holder will ensure that stores can reuse signs without the signs becoming damaged. 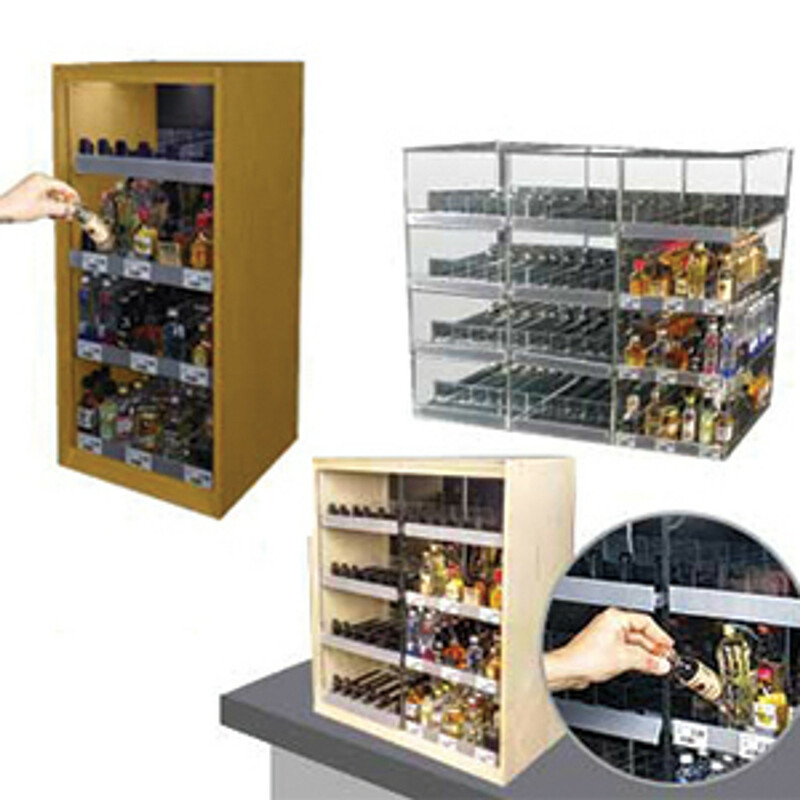 Smoother shelving units and glass on beverage cooler doors aren't exempt from eye-catching aisle invaders - there are suction cup aisle violator holders for sale, also. These are industrial grade plastic suction cups, designed to stick and stay in place on coolers and freezer cases at retail. 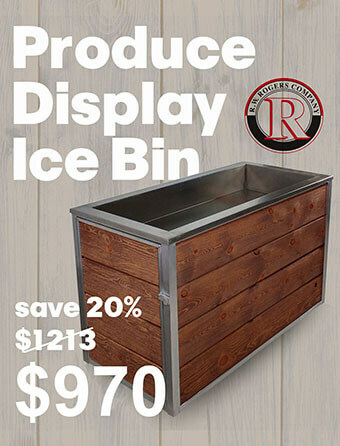 These can best be used in stores that want the best beverage cooler merchandising ideas and freezer case merchandising ideas. The suction cups will adhere as long as the surface is smooth and clean. These types have the plastic sign grippers, as well, so you can move around the sign holders and change the signage to vary the look of the store's point of purchase displays. 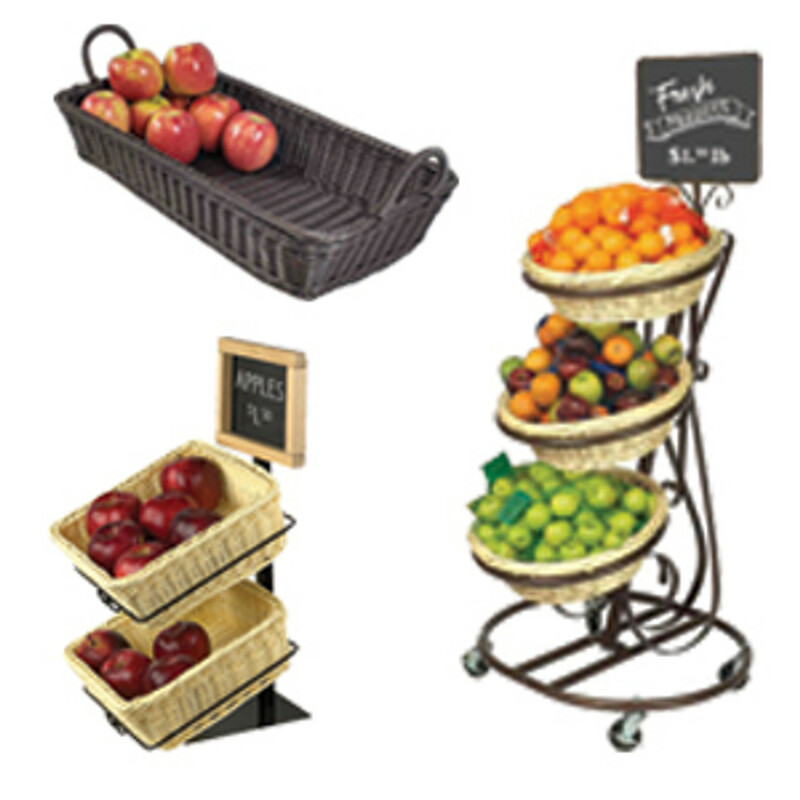 Aisle violators are a small sign with a big impact on a business's impulse sales profits. 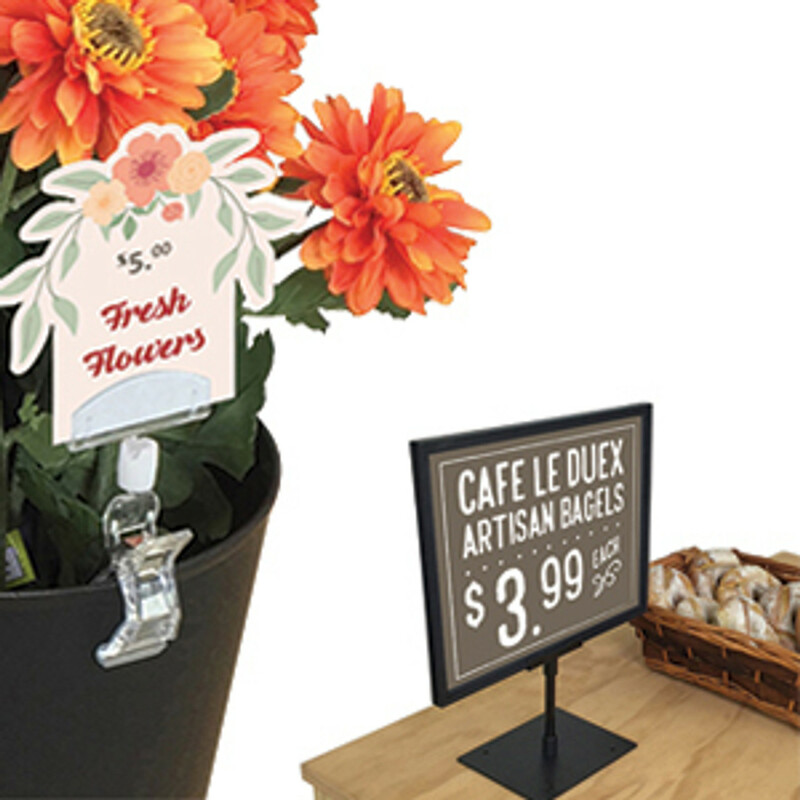 With proper placement, aisle violator signage should protrude into the store aisle and capture your customer's gaze. 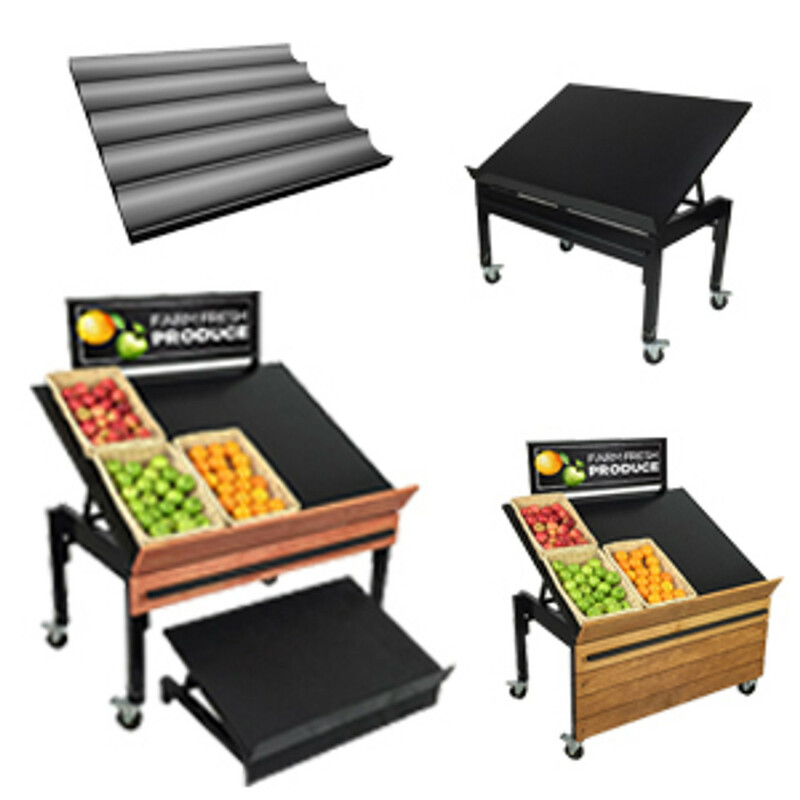 Position aisle violator sign holders on retail shelving units, refrigerated display cases and store fixtures to draw attention to high margin products that you wish to sell. 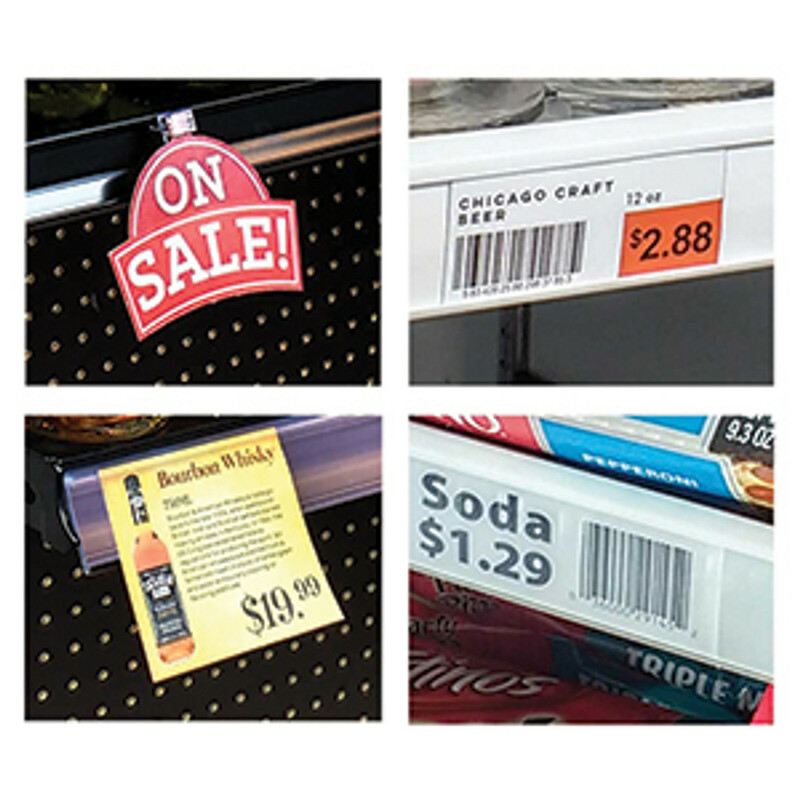 Aisle blade signs or interrupters should be placed so as not to block your shopper’s field of view of the products that they point to. 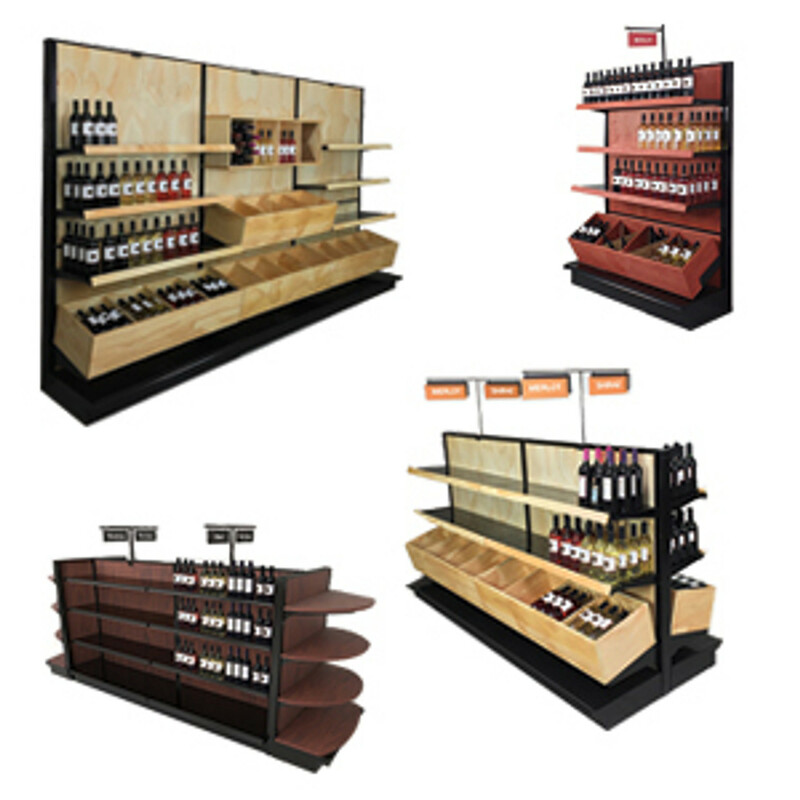 Use them on gondola shelving, retail end cap displays or beverage cooler glass doors. 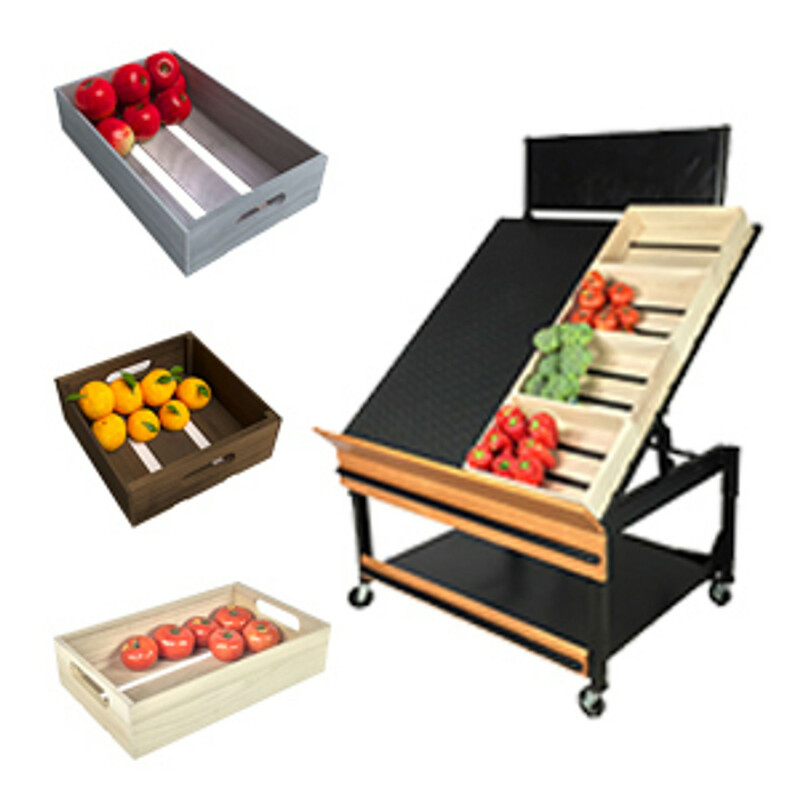 The best uses for aisle violators are to draw attention to special pricing, new products, store events and promotional items that the business wishes to sell or promote quickly. 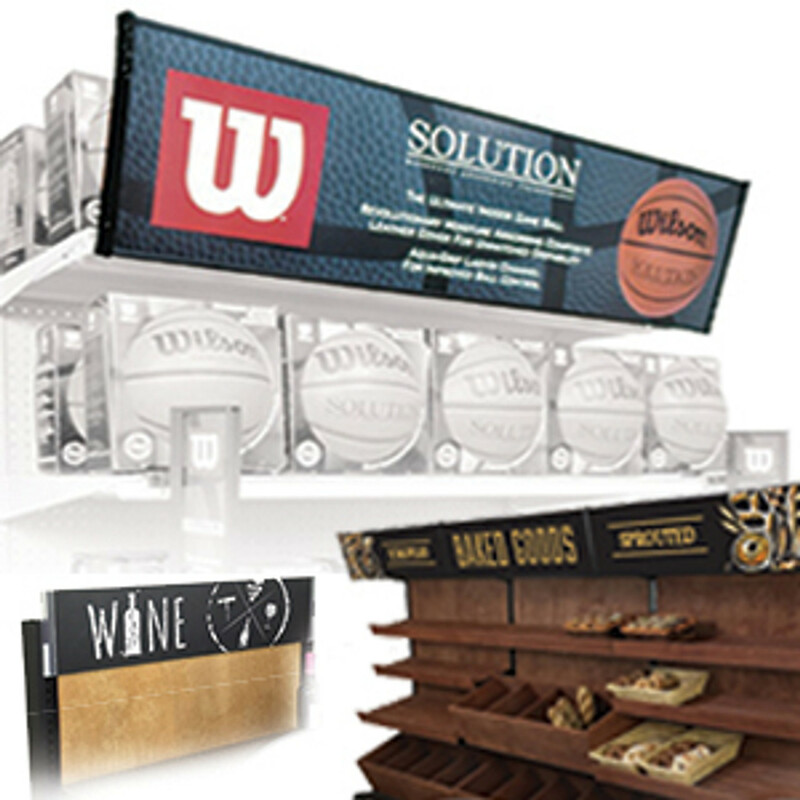 With several styles of sign holders, as well as methods of adhesion, there really is no limit to how a business can display aisle violators. They can be subtle, or truly in your face, and they are proven effective in increasing sales. Ceramic Magnetic Sign Holder Clip, Holds Signs up to 1/4" Thick, Maximum Grip!